Antique Map East Indies by Kitchin titled ‘EAST INDIES, from the best authorities, By Tho.s Kitchin Geo.r’. 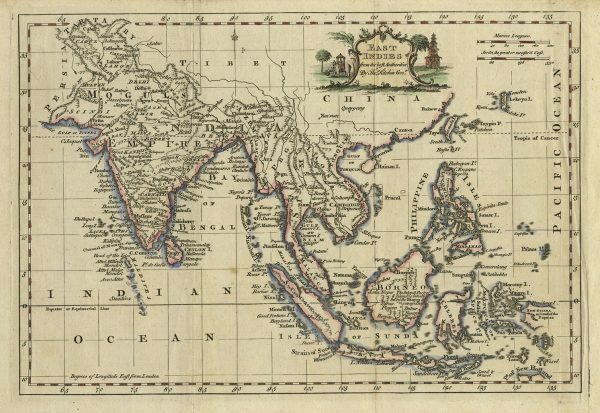 A small copper engraved map of India, Southeast Asia and the East Indies in modern hand colour by Thomas Kitchin (1719-1784), mapmaker, engraver and hydrographer to King George III who was originally apprenticed to Emanuel Bowen the great 18th century English cartographer and engraver, and possibly published in The Small English Atlas around 1780. English maps of this period (late 18th century) were superior to their continental counterparts because of the accuracy with which longitude was depicted using Harrison’s marine chronometer. Measures: 191 x 282 mm.